The small black and red lighthouse sits on an outcropping of rocks called "La Ghinghetta" sitting along the shores of Portoscuso. Portoscuso sits on the southwestern side of the island of Sardegna, with a ferry line to Isola di San Pietro. 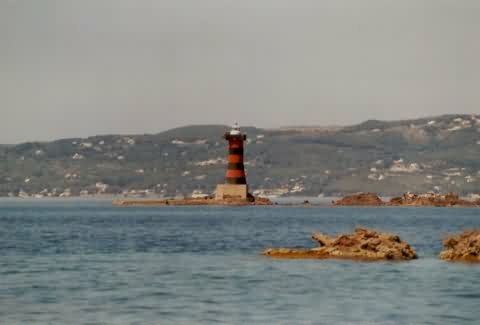 This lighthouse possibly can only be seen from boat, but if you get onto SS126 on the western side of Sardegna, drive into Portoscuso and find a coastal area to try to see the lighthouse.